Picture this. Christmas Eve, 1945. A young American officer has been working for the past two years as part of a special unit, helping to safeguard historical monuments and artifacts from the ravages of war. He’s now at the collection point established for treasures looted by the Nazis and hidden in salt mines and remote castles. Every day brings truckloads of crates containing some of the greatest masterpieces in art history, including Botticelli’s Birth of Venus. His commanding officer has gone leaving orders that no boxes are to be opened. But isn’t Christmas a time for opening boxes? With his men looking on, Major Patrick “Joe” Kelleher pries open a lid and pulls out one heck of a plum—the bust of Nefertiti. It was a moment the future director of the Princeton University Art Museum would never forget. Kelleher had been drafted into the army as a private at the start of World War II. When it came to light that he was an art historian from Princeton University, he was swiftly promoted to major and assigned to the group known as the “monuments men.” George Clooney’s film The Monuments Men celebrates the work of this group of art historians, museum curators, and art scholars like Kelleher who made up the Monuments, Fine Arts, and Archives (MFAA) unit. In addition to experts like the Metropolitan Museum of Art’s James Rorimer and George Stout of Harvard’s Fogg Art Museum, both of whom are portrayed in The Monuments Men movie, these unlikely heroes included two future directors of the Princeton University Art Museum (PUAM), Ernest T. DeWald (1891-1968) and the aforementioned Patrick J. Kelleher (1917-1985), as well as many others with deep ties to Princeton. 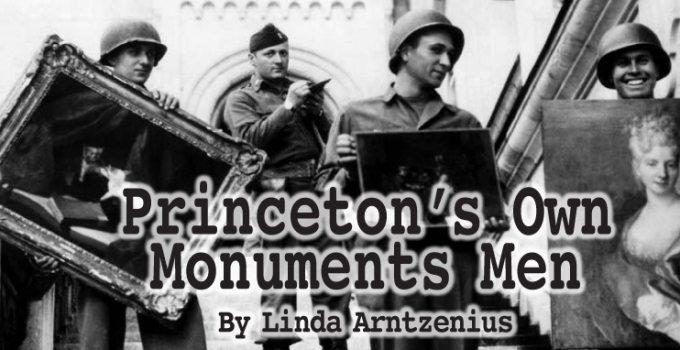 Few institutions in the United States are more connected with the history and legacy of the monuments men than the Princeton University Art Museum,” says James Steward, PUAM’s current director. When The Monuments Men opened at the Princeton Garden Theatre last month, Steward led a post-screening discussion of the history behind the film. The movie was hardly commented upon. All the attention was on the history as described by Steward and Alfred Bush, the retired Firestone Library curator who knew both DeWald and Kelleher. The film, which was inspired by Robert M. Edsel’s book The Monuments Men: Allied Heroes, Nazi Thieves and the Greatest Treasure Hunt in History, was directed by and starred Clooney alongside Matt Damon, Bill Murray, and Cate Blanchett. It relates just a small portion of the story, and falls short in accurately portraying the breadth and depth of the knowledge and skills of the highly-educated men and women whose achievements it sets out to honor. It is entertainment in Clooney’s Ocean’s Eleven vein—a group of eccentrics gathered for some seemingly hopeless endeavor. “You want us to do what? You realize we could all be shot? When do we start?” That sort of thing. Author Robert Edsel came to his subject after moving to Florence, Italy. One day, while strolling across the Ponte Vecchio, the former Texan oilman wondered how the bridge had escaped destruction during World War II. His research led him to the MFAA and the “monuments men,” 17 of whom he tracked down and interviewed. In the spring of 1945, MFAA began finding mines, caves and castles filled with hundreds of thousands of stolen objects. Ultimately they would save five million artworks, tapestries, paintings, sculptures, church bells and stained glass, much of it intended to aggrandize Hitler via a new Fuhrermuseum he was planning to build in Linz, Austria. The frustrated artist was gathering a treasure trove that would outstrip Washington’s National Gallery of Art, which had opened in 1941,and other world museums. “Hitler’s ambition rivaled that of Napoleon,” notes Steward, for whom Edsel’s book and the Clooney film raise serious questions, such as “What is art worth; is it worth human life?” Steward points out that members of the MFAA were often at odds with combat troops in front line situations. In 2007, Edsel founded the non-profit Monuments Men Foundation to memorialize and celebrate the work of the MFAA and to highlight the number of artworks that have yet to be recovered. Missing works include Raphael’s Portrait of a Young Man, seen being destroyed by fire to dramatic effect in the film version of his book. The discovery just last year of a cache of modern paintings, including art by Picasso and Matisse, in the Munich apartment of the son of a prominent Nazi art dealer, has encouraged Edsel’s hopes. The Monuments Men Foundation welcomed the Clooney film as a way of engaging the public in the search for more lost art treasures. “This was the first time in history that an army had been fighting a war while officially seeking to reduce damage to the world’s cultural heritage,” says Steward. “General Dwight D. Eisenhower, supreme commander of the Allied forces, personally prohibited looting and destruction of buildings of cultural significance.” Eisenhower famously told his commanders just before D-Day: “Inevitably, in the path of our advance will be found historical monuments and cultural centers which symbolize to the world all that we are fighting to preserve.” His orders were to safeguard those treasures, where possible. While The Monuments Men movie alludes to a grab by the Soviet Trophy Commission, it makes no mention of the role played by the MFAA in Italy. “The movie leaves out at least 98 percent of what happened,” says Steward, who saw looted art treasures first-hand while working for a time as a curator at the Hermitage Museum in St. Petersburg. Treated to a private tour by fellow museum curators, he recalls Modernist works “acquired” during the war. Russia has yet to acknowledge some 2.5 million objects appropriated in 1945 as reparation against Germany. Such treasures include famous gold artifacts excavated by the 19th-century field archeologist Heinrich Schliemann at Troy. A scholar of Medieval and Renaissance art, DeWald completed his Ph.D. at Princeton in 1916 and joined the faculty in 1925, after serving in World War I. By the time he volunteered for WWII, he was middle-aged. He directed the Princeton Art Museum from 1947 until his retirement in 1960. A highlight of his tenure came in 1950, when the Austrian government allowed Johannes Vermeer’s The Art of Painting to come to Princeton on loan for a brief period. Kelleher, who led the Greater Hesse Division of the MFAA, immediately succeeded DeWald as PUAM director in 1960, serving until 1972. Like DeWald, Kelleher trained at Princeton, completing his Ph.D. in 1947. He was a specialist in early Christian art, which is perhaps why he was the perfect man to safeguard the priceless St. Stephen’s Crown, Hungary’s 1,000-year-old symbol of national sovereignty. As Bush, who heard the story many times from his friend, tells it, “The Hungarians were worried about what might happen when troops from Soviet Russia got into Budapest, and in order to prevent the crown falling into the hands of the Communists, they brought it to Joe for safe keeping.” The crown was ultimately shipped to the United States and held in Fort Knox until it was returned to Hungary in 1978. Kelleher, who authored a monograph titled, The Holy Crown of Hungary, had retired from the Princeton University Art Museum by then but he was called in to examine it one more time before it returned to Budapest, where it is now on display in the National Museum. At the IAS, the brightest and best did not bury their heads in their studies when it came to what was going on in Europe. How could they? Many of them were well-acquainted with Hitler’s Germany. Erwin Panofsky (1892-1968), for example, lost some 35 relatives in concentration camps. The art historian and essayist, whose famous books include The Life and Art of Albrecht Dürer (1943) and Studies in Iconology (1939), became a naturalized citizen of the U.S. in 1940 and helped the Commission for the Preservation of Cultural Monuments. He contributed to the preparation of maps and tables of information about cultural monuments in Germany for use by the American air force and artillery. It was hoped that such information use might help to minimize bomb damage to cultural and historical treasures there. The German-born art historian Kurt Weitzmann (1904-1993), a specialist in Byzantine and Medieval art, also assisted the cultural monuments preservation project. Weitzmann had faced persecution in Germany when he refused to join the Nazi party. He immigrated to the United States in 1935 and found a place at the Institute, where he remained until 1972. While IAS scientists and mathematicians such as John von Neumann and Marston Morse did their bit in terms of ordinance work, humanists like Elias Lowe worked on a list of important archives and libraries in Italy. Others edited handbooks of the art treasures in Italy and Paris. Elsewhere in Aydelotte’s report, the faculty’s current research is given, resulting in a charming juxtaposition that speaks volumes about the IAS. Next to mention of von Neumann’s current interests for 1945 (logics of quantum mechanics; high speed computing and its applications; shock waves and their interaction) are those of Otto E. Neugebauer—the Babylonian theory of the moon. A case of life, once again, trumping fiction.